Here is yet another opportunity for you aspiring producers out there to get your name out and talents heard by many. 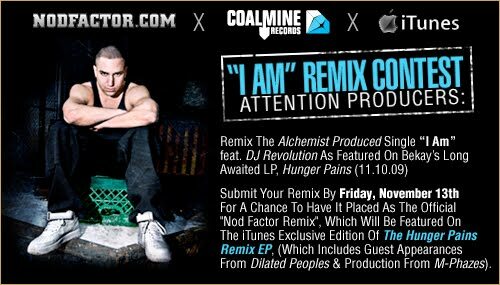 Peep the info below for your chance to be a part of this exclusive digital remix single which will be featured on Bekay's Hunger Pains Remix EP, out late-December or early-January. Winning producer will also be awarded a watch of choice courtesty of FludWatches.com. 1.11.03 (Tuesday): Contest begins. NodFactor.com will premier the contest that will be virally promoted through other lifestyles, sites and blogs throughout the week, courtesy of Diamond Music Group. The contest will also be reinforced through an e-blastcampaign. 3.11.14-15 (Sat/Sun): Winner will be selected through a judging panel consisting of the staff at NodFactor.com, Bekay & Matt Diamond of Coalmine Records. 4.11.16-20 (Mon-Fri): The winning remix will first be announced to all contestants via email. Following the announcement, NodFactor.com will premier the footage of the judging panel. Shortly after, Diamond Music Group will virally promote the vlog footage through all major hip-hop blogs & lifestyles.